Ski Packages Are Included in the Search! The sport that brings most people to the Poconos is skiing / snowboarding). For those who do not ski, but enjoy outdoor snow activities, there is snow tubing. Camelback Mountain is the area's largest winter resort, with Shawnee and Jack Frost tied for a close second. Blue Mountain has the highest vertical and the longest run, but not as many slopes as the others and is in a less convenient location. Accommodations are scarce slopeside and most winter visitors stay in a nearby hotel or inn. Below is an insider's guide to the ski resorts in the Poconos. Tannersville, PA has 33 slopes, 13 lifts, and snow tubing park. The largest winter resort in the Poconos. Voted the "Best Ski Resort in the Poconos" 2010. Check out Matt and Drew's review for the reasons. (It has something to do with the cheeseburgers). Well maintained slopes, lodge and grounds. Quick and seasy parkign with shuttles to the slopes. A snow tubing park accessible from the main lodge with a shuttle. Friendly well trained staff. The most trails down the mountain and in the snow tubing park. The most lifts and usually short lift lines. (They close ticket sales when the lines get longer than about 20 minutes. A bold move.) This resort is customer oriented and works hard to make snow sports fun. 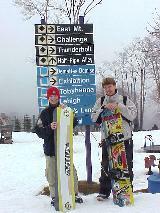 Shawnee Ski Resort Shawnee-on-the-Delaware, PA - has 23 slopes, 9 lifts, snow tubing. Ya can't get closer to New Jersey and New York than this. Only about 7 min from New Jersey. Trails vary from easy to expert. 2 terrain parks for snowboarding, Base Lodge, Ski School, Restaurants and Bar. Try to go mornings or on the off peak days and hours for the best experience. For snowboarders there are two newly excavated step down jumps at the beginning of the trail. These jumps will add to the existing jump line and will also add to the overall flow of the park. For beginners morning, afternoon and full day programs are offered daily by Shawnee's specially trained staff. Big Boulder Lake Harmony, PA has 14 slopes, 7 lifts, snow tubing. The Little Sister of Jack Frost. But, the longest running ski resort in the Poconos and the First to Open most years!. A great place to learn. The Home of snowmaking in the Poconos. Good elevation so the snow is usually here earliest in the season and latest in the spring. A great boarder mountain (see the review). This was the first commercial ski resort in Pennsylvania, and it was here that snowmaking was first used successfully in a commercial application. Big Boulder PARK has quickly shot to the top of the mid-Atlantic region and for the 08/09 season, TransWorld Snowboarding has rated us a top 5 Terrain Park on the East Coast of Canada and the United States�no small feat for a Pocono ski resort not used to playing on a national stage. But nothing less will do for the cast and crew behind the scenes at Boulder PARK. 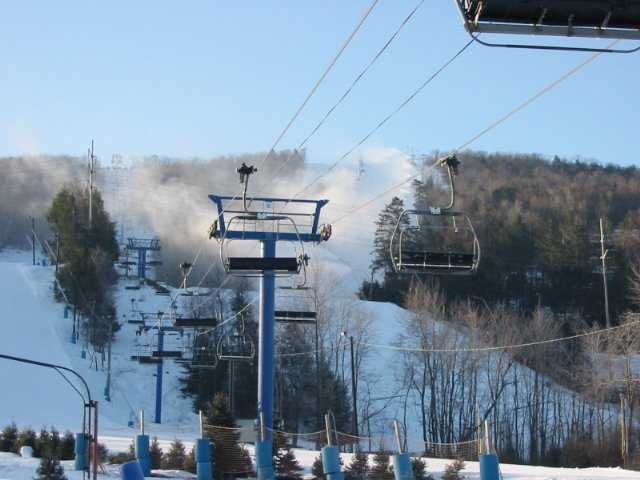 Jack Frost Ski Resort Blakeslee, PA has 21 slopes, 7 lifts, snow tubing. Widest trails, lodge at top of mountain, sister of Big Boulder. Blakeslee. Great Views of just empty mountains from most of the slopes. Feels like you're truely in the woods. Good size and equipped lodge, up to date rentals, well patrolled and over all a great skiing experience. Jack Frost with it's wider trials tends to be the best cruising mountain in the Poconos. Slightly less crowded than the others. The new ONE Park will be a perfect extension of BBPark at Jack Frost, with a run fine-tuned for beginners and intermediate-level participants that will still hold value for experts. Translation: famous Boulder Park fun for everyone, now open earlier. ONE Park will offer a much longer trail, so you can bet that there will be some unique features at ONE Park that we just can't pull off at Boulder PARK. Jack Frost opens 9am midweek and 8am Saturday and Sunday, so bring your family and friends 7 days a week to ONE Park and get your park on. Blue Mountain Ski Area Near Jim Thorpe, PA - has 1,082-foot vertical, plenty of trails for ALL abilities plus a half-pipe and two terrain parks. Blue Mountain has 30 slopes, 8 lifts - including a high-speed detachable quad. Snowtubing is a great alternative for the family or group of friends just wanting some wintertime excitement. And there are two lodges one at the base and one at the summit. The highest vertical in Pennsylvania (1,082 feet), Four terrain parks and a snowcross trail, 34 trails for all abilities on 158 skiable acres, Longest run is 6,400 feet, A huge snow tubing park with 21 slides, Intensive snowmaking & grooming for perfect conditions on every slope, 9 lifts, including the only detachable high-speed six-pack lift in the area, 100% lit trails for evening snow sports fun. Ski Big Bear at Masthope Mountain - HC1 BOX 1A 353 Lackawaxen, PA 18435 is a great place to learn to ski or snowboard. They have patient and fun instructors who work hard to help you succeed. They also have a variety of terrain, allowing you to gradually progress but also allowing your friends and family who may not be beginners to ski or snowboard more challenging terrain. First time skiers and snowboarders are usually excited to try but also a little nervous about trying something new. 18 Trails. 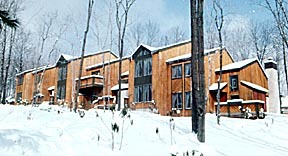 Pocono Manor Resort has - Cross-country skiing and ice skating. (no downhill, but near Camelback) A real treasure of an inn. Old time family fun. Pocono Manor Classic cross country trails with a balance of flat, downhill and uphill. Some views and you'll not get lost if you go slightly out of bounds. A great family retreat with things to do for the kids while mom and dad go x-country. Book Your Pocono Ski Vacation Lodging Online Here!